The Tower of London was founded in 1066 by William the Conqueror and is one of the world's most spectacular and famous fortresses. It has a history of being a royal palace as well as a prison, place of execution, mint, and jewel house. The Tower attracts over 2½ million visitors a year and allows you to discover and learn more about the history and even view of the Crown Jewels. 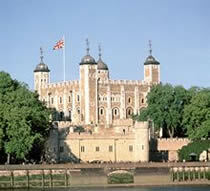 Many high-profile and highly ranked prisoners were kept at the Tower of London, mainly in the Beauchamp Tower, where they were kept with their servants until their execution or release from prison.